This demonstration session shows how to work with an Inner Critic part. 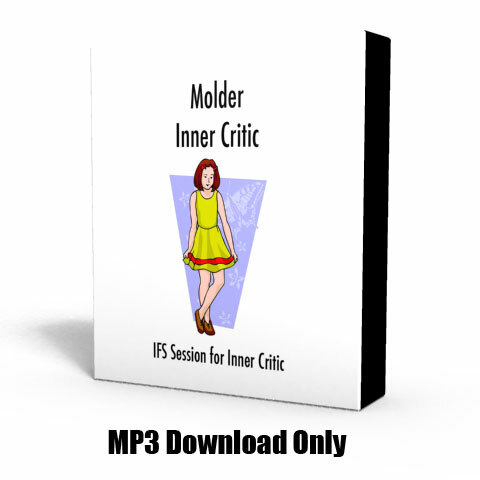 We have identified seven types of Inner Critics; this is one is a Molder. The Molder tries to get you to fit a certain societal mold or act in a certain way that is based on your own family experience or culture. This can be any kind of mold—e.g., caring, aggressive, or polite. It attacks you when you don’t fit in and praises you when you do. In this demo from an Inner Critic Class, the student says she is hearing the voice of a Molder Critic that says, “You must fit in.” She identifies a Criticized Child Part whom she puts safely with her Inner Champion. She proceeds to get to know the Critic and get some perspective on what it wants for her.